Samsung Galaxy S4 price confirmed as pre-orders open in UK | What Hi-Fi? The Samsung Galaxy S4 price has been confirmed as £629.95, as pre-orders open for the phone in the UK. You can buy the Galaxy S4 from Amazon or Carphone Warehouse without a contract (SIM only) for £629.95, or cheaper if you sign-up for a contract from the likes of EE, O2, Orange, T-Mobile, Three and Vodafone. You can get the Galaxy S4 for as little as £20 if you're prepared to pay £61 per month on contract with T-Mobile, or around £270 if you'd rather pay a more affordable £31 per month with 4G network EE. The Samsung Galaxy S4 release date is April 26th, and pre-orders have opened today for both the handset-only and contract options as above. The Galaxy S4's predecessor, the Samsung Galaxy S3, has topped smartphone sales charts for the last nine months, having powered past 40 million worldwide sales back in January 2013. The new S4 flagship phone, which launched in New York earlier this month, will hope to emulate the S3's success, pitting its hopes on a larger, 5in full HD screen and a range of new features. 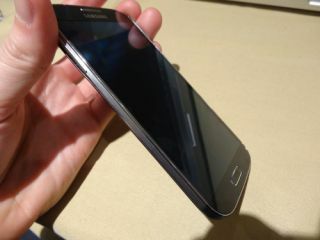 Despite some confusion over the Samsung Galaxy S4 processor in the UK model, anticipation for the new phone remains sky-high. You can read our full hands-on Samsung Galaxy S4 review now and we look forward to giving the phone the full review treatment, and putting it up against the likes of the HTC One, Sony Xperia Z, Google Nexus 4 and Apple iPhone 5, just as soon as we can get our hands on one.